Splash Damage’s game of mucky munitions has been ticking along quietly since its open beta release in June, delighting would-be mercenaries with a penchant for objective-based shooting, teamplay and retrieving family heirlooms from contaminated London at the behest of the displaced rich. 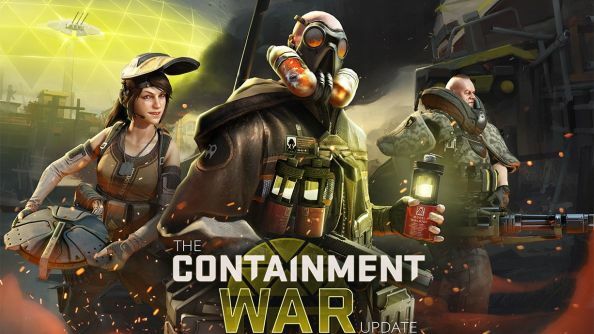 It’ll declare full-on Containment War tomorrow, introducing a new molotov-equipped mercenary, an intriguing Millennium Dome arena, and an Execution mode with its own attendant maps. Want to blow baddies away in a variety of colourful locations? These are the best first-person shooters. The Dome is suitable for both Objective and Stopwatch mode, and is reportedly “colossal”. Stoker, who resembles the Pyro and extols the virtues of the “great British barbecue”, is the 17th merc to come to the capital. His molotov grenades can close down chokepoints, and his deployable ammo station will resupply allies. Execution is a single-life mode played out over 12 rounds with the idea of wiping out enemies or exploding a segment of the Containment Shield, found on new maps Overground and Market. Think you might catch a train to King’s Cross? There are limited edition loadout cards in it for you, plus the promise of a free medic unlock if you log in over the next week.